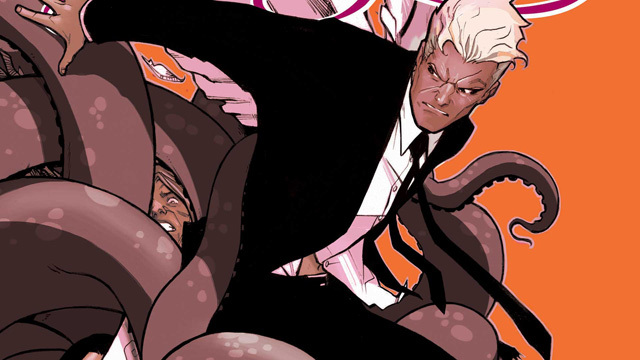 LUCIFER #7 Review | Warped Factor - Words in the Key of Geek. What is the point of evil? Is it there to make a benevolent God look good? Or is it there because there is no benevolent God? 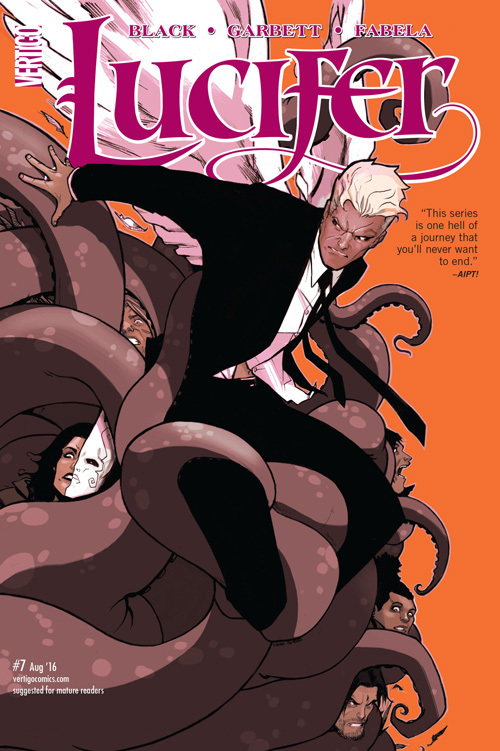 A new story arc begins in issue #7 of Lucifer, but you're gonna want to catch up on the previous 6 issues before jumping into this one, for this series is already heavy in its own mythology. Metatron sent Gabriel with the sword to kill Lucifer, but Lucifer is alive, Gabriel doesn’t have the sword, and God has transformed into - well what is that exactly? Is Lucifer really morning the loss of God? It seems Earth is losing hope; people are burning themselves in despair. And Raphael is descending to talk to Lorin, and gives him sweets for temptation? Just who is on the side of good? Now he’s in Hell, it seems that Takehiko wants the Throne of Hell, well he is the son of Lucifer Morningstar and Izanami-No-Mikoto, a twice over Prince of Hell, so there might be something in this inheritance thing. But who thinks Mazikeen is going to give up so readily? And who invited Lucifer to a ringside seat? Issue #7 of Lucifer leaves us with a lot of questions; what happened to Metatron? What is Raphael about to Confess? And why confess to Lucifer? What’s Gabriel doing? The thing with this issue is that it’s starting to draw together a lot of interesting threads and it’s raising all those extra questions too, which is guaranteed to keep a reader reading. The interplay of relationships in this arc (as opposed to that Ark), is fun to watch. Like in life, this isn’t as simple or as obvious, as black or as white as it should be. There are myriad shades of grey. With good writing, good art, and great story weaving, I have to give issue #7 of Lucifer a four out of five.